Just got fibre installed today and i have a couple of questions. 1) how long does it take for voip to be connected? When i make an outbound call, i receive a 'welcome to the spark voice test line' message, then it hangs up. When i call this landline, i hear the ringing on my mobile, but the phone itself doesnt ring? 2) the internet, WLAN and WAN lights blinks occasionally on the modem. According to the manual, the first 2 should blink but the WAN should be solid for fibre? 3) when my wireless device (iphone/ipad) is put on lock and then i unlock it, it takes about 5 seconds for the wifi to reconnect whereas before it would reconnect instantly. Is this due to the new modem? 1) It sounds like you haven't yet been cut across to the VoIP line rather it's still terminating on the POTS copper line. Normally it's done same day from what I understand but there can sometimes be a lag of a day or two. 2) If the internet is working... then the internet is working. I wouldn't worry if the light was blinking or solid. Most likely a typo in the manual. 3) Not sure... I suspect it may be a feature of your phone as it must be disconnecting when you lock your phone. Did you upgrade it recently? How long should i wait before i try contact Spark again? Is there a number i can call directly to their 'voice team'? When i called yesterday, i called 120 and selected landline at the menu but what i gather, thats a different team to voip? Cool i wont worry about the light and also that wifi disconnect seemed to have sorted itself after a reset of the router and phone, so all good there! simple, call on monday when they are open. dont worry about the lights if its working and you get the speed your paying for do the lights really matter? apple devices are not wifi certified any more so thay dont exactally play by the rules that the routers play by. that could be your problem. Ok just an update. I called Spark and got transferred to their provisioning team who advised me my 'order' was still open and they would close it. Once its closed (they said to allow till Wednesday), i have to go to the Spark website and order fibre landline. Then if all goes well i should have the landline working by the end of the week...does this sound right? When i ordered my fibre plan, i ordered a fibre and landline plan. Not sure why i have to re-order the landline? Is there anyway to speed this process up, as it seems like there's alot of uncertainty as to when it will actually be ready. On a side note, does this wifi speed appear normal compared to the wired? The download speed halves whereas the upload barely changes? 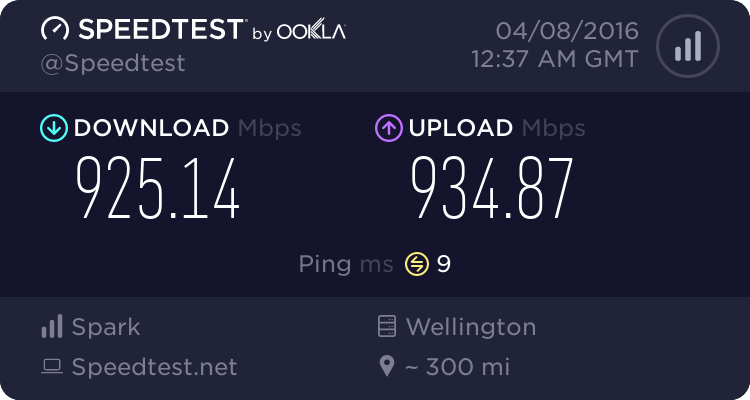 Can I improve the wireless download speed? I've tried changing channels from 1-11 and this is the best i got. EviLClouD: Ok just an update. I called Spark and got transferred to their provisioning team who advised me my 'order' was still open and they would close it. Once its closed (they said to allow till Wednesday), i have to go to the Spark website and order fibre landline. Then if all goes well i should have the landline working by the end of the week...does this sound right? What type of Wireless do you have on your Router and your Computer? its probably wifi n connected at 65mbps if thats the max your getting over it. if it were wifi n connected at 130 i would expect it to max out at about 100mbps. Its connected using the Spark supplied Huawei HG630b and the Asus P8Z77-V wifi that comes with the motherboard. From what i understand they're all wireless N.
If it helps, i receive the same download speeds on both my iphone and ipad, even when standing directly in front of the router. Could it be that the router is restricting the download speed? Jase2985: its probably wifi n connected at 65mbps if thats the max your getting over it. Am i able to change it to 130? or am i stuck with 65? I did some digging and i think i may have found the cause of the issue. I've found out its a Atheros AR9485 wireless chip. According to specs, it supports up to 150Mbps. But it also says, use WPA2 or open systems to reach 65Mbps and above. So I think i might need to change the security setting to just WPA2 on the router. Does this sound right? Security WEP, WPA & WPA2* *Use WPA2 or open system to reach 65Mbps and above. The datarate settings seem to say you need to have 802.11n on the 40Mhz bandwidth setting to get 150Mbps. Unless you're on 802.11ac then you can probably much forget about getting 100Mbps of _actual_ throughput over wifi from a cellular device. Anything much beyond 50Mbps over 802.11n usually requires multiple aerials on the devices at both ends and/or the right magic combination of chipsets and settings. The numbers thrown around for WiFi performance should generally be taken with a huge grain of salt as there's so many factors involved. I use 802.11ac @ 5Ghz at home and get >100Mbps of _actual_ throughput, if I drop it to 802.11n then the speed roughly halves. you need to use 40Mhz channel widths to get 150mbps over single chain wifi n. The downside is that as its a bigger spectrum its more susceptible to interference. Thanks for that info, i will read up on it when i get home! Jase2985: you need to use 40Mhz channel widths to get 150mbps over single chain wifi n. The downside is that as its a bigger spectrum its more susceptible to interference. Please don't do this. It makes everyone in the area cry. 2.4Ghz is busy enough without consuming double the channels. OK, so it would appear what the OP ordered online (fibre broadband and fibre voice) is not what was provisioned - due to human error. Your broadband was migrated from ADSL to fibre successfully, however no change/upgrade was made to the provisioning of your phone service. There would normally have been no issue with this, but unfortunately the technician completed the wiring work for fibre voice at your house, even though he had no work order for this. This led to the loss of your copper service when the tech disconnected the copper service lead from your house. My apologies for this - I have seen a few cases of this now so it has been raised as a serious customer impacting issue. I believe the cause is that Chorus technicians have been advised to prepare all Spark fibre customers for VOF on every Spark fibre installation they complete, even if they have not received a specific order from Spark to do so. Hopefully that situation can be resolved soon so there are no repeats of this. I can confirm the landline is up and running now. Thanks to Wheelbarrow01 for following this up. On a side note, i also can confirm the pc wifi card is restricted by the 20mhz channel. If i manually change it to 40mhz i can receive speeds of up to 75Mbps, but they're aren't consitent and tend to fluctuate alot.